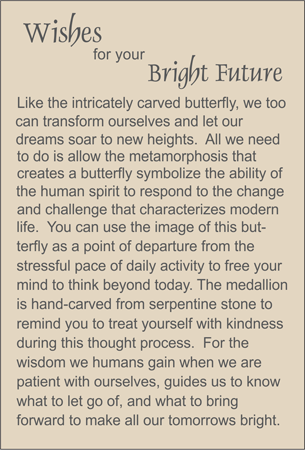 MEDALLION: Celadon color new jade hand carved medallion depicting a butterfly whose metamorphosis can represent our need for transformation. ACCENTS: New jade pillow and faceted rock quartz crystal globe. COMMENTS: This color is so neutral that it can coordinate with a wide variety of china patterns. See related styles by scrolling down.